In dealing with Workplace Savings Programs, there can be a lot of confusion with the difference acronyms in the financial industry. One of the common misunderstandings is knowing the difference between LIRAs and RRSPs. The RRSP is a tax sheltered savings plan designed to help Canadians save for retirement. Contributions to a RRSP are voluntary and subject to contribution limits. When you contribute to a RRSP, you save money in taxes because you get a tax deduction. There is no tax on the growth of the investments inside the RRSP. Tax is paid when money is withdrawn from the RRSP. As long as you are employed by a company or organization with a pension, your money stays in that pension. There are two kinds of pension plans – defined benefit plans and defined contribution plans. A LIRA is a Locked-In Retirement Account and is designed for accumulation of pension money outside a pension plan. If you do not need income from your pension funds, then a LIRA allows you to manage your pension funds personally. A LIRA is just another type of registered account much like an RRSP. Think of them both as ‘buckets’ of money. Locked in Retirement accounts (LIRAs) are accounts that hold pension funds once you are no longer employed or part of the pension plan. If you have a LIRA it’s because you were part of a pension plan with a previous employer. When you leave and employer prior to retirement, you will be given an options package from the pension plan. You may have the choice to move the money into a personal plan but any locked in portion of the pension must go into a LIRA. But when you leave that company, Many people assume you can move pension money into a RRSP but that can only happen if it is a relatively small amount of money. LIRAs hold pension money. RRSPs hold money that you have directly contributed on your own. Because Locked-In Retirement Accounts hold pension money, you cannot make direct contributions into a LIRA. The money has to be transferred in from a pension. With RRSPs, you can take money out whenever you want and there are no restrictions on how much money you can take out. Any withdrawals are subject to taxation. Although it may not be ideal, you can cash out all of your RRSPs at once. With LIRAs, you are restricted on withdrawals. Firstly, you cannot take out lump sum withdrawals out of a Locked-in Retirement Account hence why that are called ‘Locked-in’. If you want income, you must move the money into a LIF or Life Annuity. With RRSPs, you are eligible to participate in the Home Buyers Plan and the Lifelong Learning Plan. Any funds in a LIRA are not eligible for these programs. LIRAs are guided under pension law, which is provincially regulated. As a result, the rules can differ from province to province. RRSPs are regulated through the income tax act so the rules are the same across Canada. 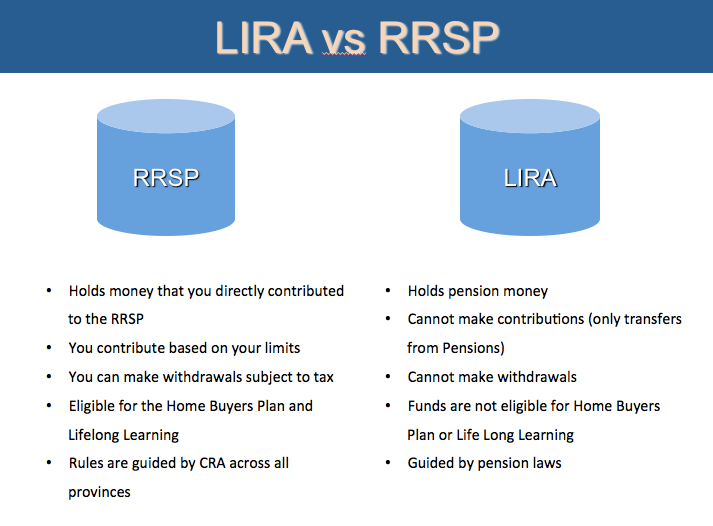 Similarities between LIRAs and RRSPs. The taxation of the plans are essentially the same. As long as the money stays in the LIRA or RRSP, there is no tax on the growth. Tax is payable on the withdrawals or income created from these account. Technically, LIRAs do not allow withdrawals or income so there is no tax. LIRAs can be converted to a LIF or an annuity if income is desired. All of the investment options available in the RRSP are essentially the same as the investment options in the LIRA. You can invest in many different types of investments like GICs, bonds, mutual funds, stocks, etc. When you eventually need to move from the accumulation phase in life to the income phase, a Life Income Fund (LIF) is one of the options for income. A LIF is used to convert LIRA money to income just like a RRIF is used to convert RRSPs to income. Just like the LIRA has similarities to the RRSP, the LIF has a lot of similarities to the RRIF. A Life Income Fund is designed to create regular income. If we used the bucket analogy, the LIF and the RRIF are just buckets with holes in them. In both cases, there is a minimum income that must come out of then plan. Income is only taxed when you receive income. In both the RRIF and the LIF, you can invest in many different types of investments like GICs, bonds, mutual funds, stocks, etc. Great details as always Jim! Good information. Can I set up a Self-directed LIRA, similar to Self-directed RRSP? What age can we withdraw money from LIRA? Is it possible to use it as in-kind contribution to RRSP? It depends on the province that the pension originates from . Every province has it’s own pension legislation. In most provinces, the earliest age you can start income is age 55. Some provinces allow you to start income as early as age 50. I understand by age 71, one must convert RRSP into RRIF. Is there such age limitation on LIRA? Hi Jim. What would be the advantage or disadvantage to leaving RRSP monies in the RRSP and just taking out as needed versus converting to a RRIF and LIF before age 71. I’m thinking there would be more freedom in controlling the income from those RRSP’s instead of the government eeking out what they say are the limits or maximum limits. The taxes would be the same, would they not? Can you recieve EI in Canada if you are withdrawing from a LIRA.